How will I find out my child's school is closed or delayed or my child is being sent home early or relocated? When all schools are closed or delayed or students are being sent home early, parents and caregivers will be notified through the media and CMSD posts to its Facebook and Twitter pages. When one school or a group of schools are closed or delayed, the parents and caregivers will be notified through emergency contact numbers on file at the school. CMSD also will post this information on Facebook and Twitter. Whenever practical, notice by school telephone chains, the School District’s Interactive Voice Recording (IVR) system and District website will also be used. When will I find out that the school is closed, delayed or my child is being sent home early or relocated? When all schools are closed, you will be told by 6 a.m. When one school or group of schools will be closed, the decision will be made at least 2 hours prior to the school opening if at all possible. The Chief Executive Officer (CEO) will decide by 5:45 am. By 6 a.m., the decision will be posted on social media and mainstream media will be notified. Who decides to close school, delay school start, dismiss school early or relocate a students? The CEO makes the final decision, but the Chief Operating Officer and Deputy Chief of Operations also may recommend closure, delay or early dismissal to CEO after discussions with Safety & Security and Transportation officials. In the case of relocation, the CEO consults with the Academic Superintendent, notifies the school, Chief of Safety, Transportation, Strategic Communications and the Executive Director of Food Service. Central office support will be assigned to assist the school to be relocated. What are the acceptable reasons? Acceptable reasons include hazardous weather, interruption of water, electricity or similar services and other conditions making it impractical to open a school building or conditions that warrant closing. 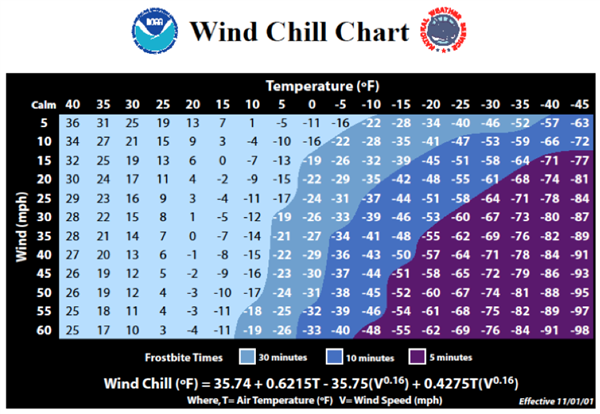 Weather variables include wind chill temperature (a wind chill temperature of minus 15 degrees as forecast by the National Oceanic and Atmospheric Administration and the National Weather Service and the NOAA-NWS Wind Chill Chart, displayed below), precipitation (freezing rain or sleet; ice on the ground; 5-10 inches of snow on the ground; and 3 or more inches of snow overnight on top of existing snow), visibility (less than 50 feet); street or sidewalk conditions (icy or deep snow) or city advisories (airport, travel or street “advisory” or “warning” issued by city or weather services). Will after-school, before-school or weekend activities be cancelled? After-school activities are canceled when all schools are closed, and students are sent home early or relocated. Activities are not canceled when school is delayed. Activities are canceled at individual or groups of schools if those schools are closed. Before-school activities are canceled when all schools, one school or a group are closed or delayed. Weekend activities will be judged on a day-to-day basis (i.e. Friday, Saturday and Sunday will each be judged separately). Activities will be canceled if schools are closed on a Friday, unless otherwise directed by CEO (all events), Commissioner of Athletics (athletics) or Academic Superintendents K-12 (individual school events). If the conditions that caused a closing on a Friday have changed for the better on Saturday and/or Sunday and it is safe to conduct the activities, then those will go forward as scheduled. How will I be notified if weekend events are canceled or will be held? Parents, caregivers and participants will be notified via local news stations and any call lists for participants. Do I have to be told that my child is being sent home? Parental notification is required for early dismissal of a student under 18 years old, but all parents, regardless of their students’ age, will be contacted and advised of the early dismissal. Parental consent is required for early dismissal of any student under 18 years old. Parental consent may be provided in advance with written sign-off or obtained via telephone at the time of the early dismissal. Written logs of the consent obtained should be maintained at all schools. Identification should be checked for individuals who pick up students for early dismissal. Parental consent is not required for students age 18 and older. Do school employees still go to work when schools are closed, delayed or my child is sent home? If all schools are closed: School-based employees are not expected to report to school, except custodians, who are expected to report to school unless otherwise directed by the Facilities Office. Central office staff (employees assigned to administrative sites) are expected to report unless exempted by their union agreement (e.g. Local 1199). If one or a group of schools are closed: Custodians, security personnel and building administrators must report, but teaching staff are not expected to report unless directed by the principal to assist with students who may arrive at school. Security personnel report to the Office of Safety and Security for redeployment. If children are sent home early: All employees are expected to remain at work until all students are picked up and dismissed by their supervisor, or at regular release time, whichever is earlier. If students are relocated to another school: All employees are expected to remain to assist with the relocation as directed by the principal. ￼￼￼￼￼￼￼￼￼Central office support will be assigned to assist the school to be relocated.